Om Nom shines in yet another phenomenal puzzler from ZeptoLab. 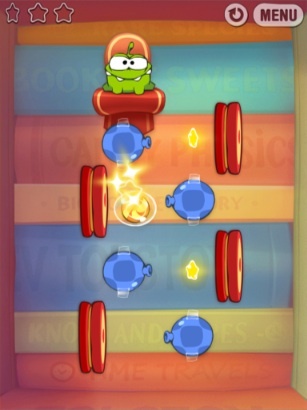 Cut the Rope is one of the few App Store video games that took on Angry Birds and lived. In fact, the critically acclaimed title has occupied a position in the top ten since it debuted almost a year ago. With a rabid fan base hungry for more, developer ZeptoLab cooked up 75 imaginative puzzles spread across three level packs. 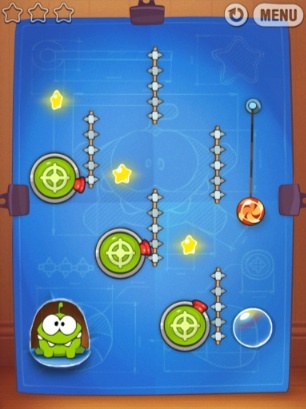 The fruit of its labor, Cut the Rope: Experiments, is a wonderful addition to the brain teasing franchise. Once again, the series' adorable critter, Om Nom, has its heart set on devouring as much candy as possible. This time, though, the little guy's wound up on the front lawn of a good-natured professor, interested in figuring out which species the creature belongs to. Apparently, the only way to do that is to concoct a series of experiments (stages) and search for hidden photo evidence. That, dear reader, is where you come in. It's your job to collect as many stars as possible while discovering those photos. Right away, the App grabs you with animated cut scenes that set the narrative in motion. You won't sit through five-minute long movies, but the professor's commentary does add some much needed personality to the series. The paper-thin story puts the focus squarely on the outstanding puzzles that require expert timing and perhaps a little bit of luck. Bottom line, you must think a couple steps ahead to beat the toughest levels, especially with the new features that provide a unique spin to the tried and true formula. This time around, you'll take control of rope shooters that let you attach pieces of rope to candy just before it falls off the screen, though it also comes in handy for zigzagging the treats through dangerous spikes and past spiders; another addition, suction cups, also play a pivotal role in filling Om Nom's belly. These elements combine with bubbles, slingshots, bouncing platforms and other objects that challenge you in exciting ways. To that end, the only downside is the lack of puzzles. Seventy-five may seem like a lot, but you'll blow through the first 25 in no time. Good luck nabbing all the stars on 26-75, though. Of course, the hunger for more is a testament to Cut the Rope: Experiments' greatness, cemented with Game Center support with achievements and leaderboards; thankfully, ZeptoLab has more levels on the way. That said, you should know what to do. Download Cut the Rope: Experiments and have a blast. It's wonderful. What's Hot: Seventy-five new levels, rope shooters and suction cups put a different spin on the gameplay, cute and colorful graphics, story elements, leaderboards, achievements. What's Not: Could use even more puzzles.